Alberto Panu has designed this Arduino-based project to remotely control a bank of AC household current outlets through an Ethernet network. 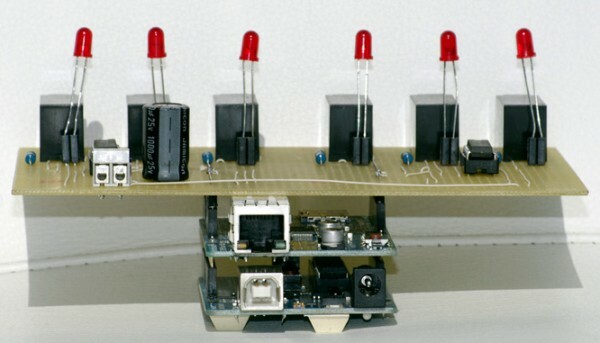 The project uses an Arduino Uno, Ethernet shield, ULN2003 Darlington transistor array along with six power relays and a handful of discrete components. The AC outlets are controlled based upon Telnet commands and the system has built in password protection. All TCP/IP parameters, the password, information about the connected systems and the power line status before the system powers down are stored in EEPROM. For schematic, source code and more details visit Alberto’s website. This entry was posted on Friday, November 23rd, 2012 at 12:01 am	and is filed under Arduino, power supply. You can follow any responses to this entry through the RSS 2.0 feed. You can skip to the end and leave a response. Pinging is currently not allowed.